I will be joining about 90% of the female population this weekend in the theater to see the second movie in the Twilight Saga, New Moon. 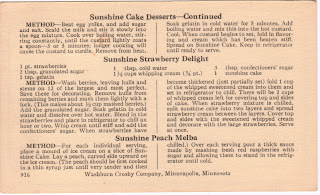 So in honor of this momentous occasion, I decided to make a special treat for my fellow vampire fanatics: Sunshine Cake Desserts. Vampires may not be able to see the sun (depending on which version of the myth you follow), but I’m thankful that I can not only enjoy the warmth of the sun on my skin, but that I can also eat tasty treats named after the giant star. I never read a vampire book until last year when I finally broke down and read Twilight to see what the fuss was all about. And that was the end of life as I knew it (thanks a lot Stephanie Meyer). I flew through all four books then started reading Charlaine Harris’ Sookie Stackhouse novels. Then of course I had to add HBO to my DirecTV package so that I could watch True Blood (based on the aforementioned books). But one of my favorite vampire series is MaryJanice Davidson’s because they are not only based in the Twin Cities, but the main vampire incurred her life-changing attack in the parking lot of Khan’s, the Mongolian restaurant down the street from my house (just one more reason never to eat there). One of the pearls of wisdom I have taken away from these books can also be applied to cooking. It has to do with trust. Vampires are not always trustworthy and neither are cooking times on recipes. As I learned last weekend, sometimes it takes longer to cook a recipe. Today, however, had the opposite outcome. 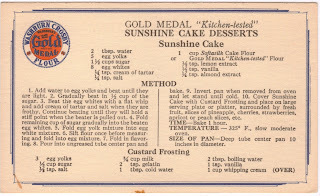 Sunshine Cake Dessert is a pretty complicated recipe (for me anyway) and there are a lot of things going on pretty much all at the same time. While I was baking the cake portion, I began the custard topping. I spent a lot of time reading and re-reading the directions to ensure I wouldn’t make a mistake. What I should have been doing was checking in on my cake every so often. Luckily, I pulled it out before it was a total loss, but it looked a little more done than I would prefer. I think the hour cooking time listed is a little too long. Another thing I’ve learned about vampires is that looks can be deceiving. The same goes for cooking. What may look overdone might actually taste like a perfect masterpiece. This cake is like a dense angel food cake with a lemon/almond flavoring. Basically, if you could bottle up summer and pour it out into cake form, this is what it would taste like. 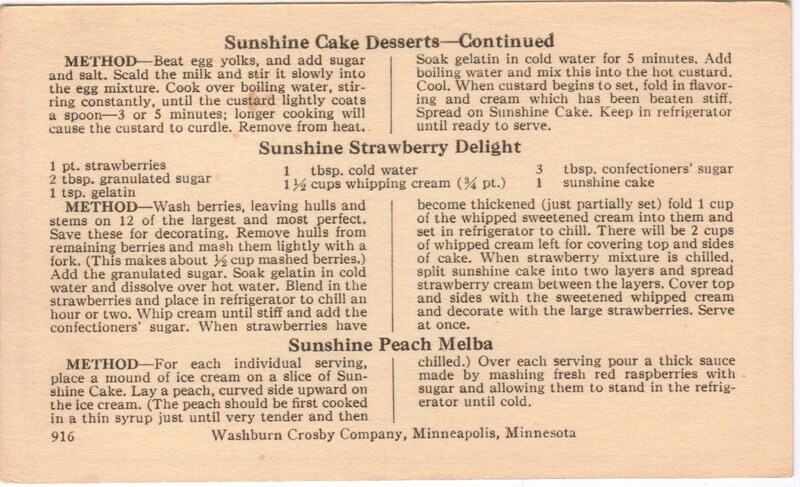 The custard frosting is a great addition and I highly recommend strawberries (or any fresh fruit) for a topping. Oh, and another tidbit I’d like to pass on – be careful when you gradually beat in sugar that you don’t pour it directly into the moving beaters. If you do, you’ll be walking all over it for a very long time across your entire kitchen floor, feel grit on your counter tops, and be brushing it out of your hair. I would also like to extend a thank you to the members of my poetry group for so graciously offering to be taste testers for a few of my Found Recipe Box creations. There are two things I know I can always count on you guys for: 1.) teasing me about my love for vampire novels and 2.) jumping at the chance to eat sweet treats with me. Thanks! Own a piece of the box! There are a few recipe cards in the box that have multiple copies. This is one of them. If you’d like to own your own piece of the Found Recipe Box, send me an e-mail at thefoundrecipebox@hotmail.com and tell me your favorite recipe that reminds you of either summer sunshine or vampires. I’ll choose the most creative entry and send you a copy of the Sunshine Cake Desserts recipe! All entries must be received by midnight November 27, 2009 and the winner will be chosen that weekend. What a fabulous post! I will think about it tonight while I am at "New Moon" with my mom & daughter. Did you see Taylor on SNL?? HE made out with a pattinson pic, TOO FUNNY.